The Spring 2014 programme has been announced. On Tuesday, 28th January Ewan McGregor and Naomi Watts star in The Impossible – a quiet family holiday in Thailand turns into a nightmare when a tsuanami hits – this gripping and realistic drama is based on true events. 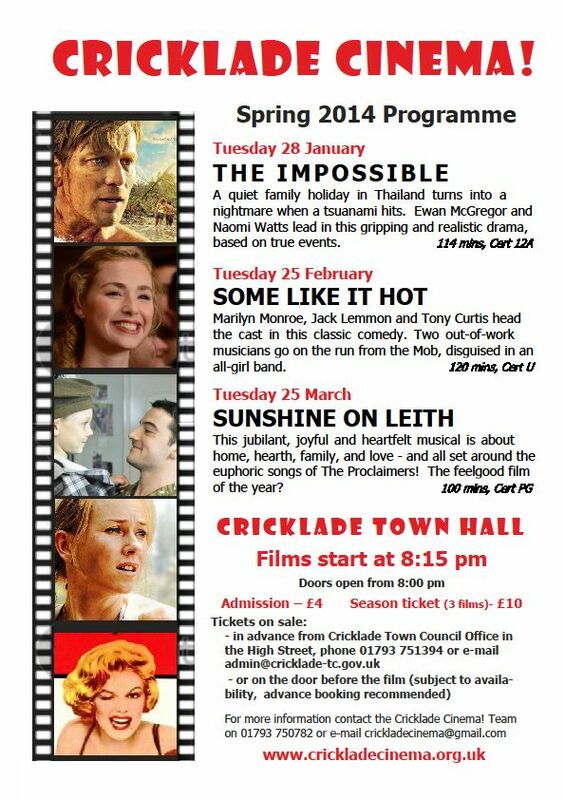 February’s film is the comedy classic Some Like It Hot and March sees the recent hit musical Sunshine on Leith coming to Cricklade. A fourth film will be shown in April – this will be a ‘people’s choice’ – choose from a selection of films which will be announced shortly. Ticket prices stay the same – £4 for single tickets/season tickets £10 for 3 films – these are on sale at the Town Council Offices – a great gift idea.